My "several" vintage 12AT7/12AX7 pile has grown to between 100 and 200! Let's see here...Going to my 1st CarverFest to hang with a great group of fellow hobbiests, to build the first tube amp I've ever owned, designed by my designated Paul Bunyan of audio, Bob Carver, with him looking over my shoulder...I score my own room in a cabin that threatens "NO" silicone, Lucas, M3 and vinyl. Who the hell ever said you can't get it completely right the first time? WOW!! Wow Kev, how many old O-scopes and Organs did you have to rob the tubes from to amass that stockpile? And....a quad of NOS RCA 6L6GTs from the 1940s. I'm hoping to get another quad but the guy is not answering. Damn shame too. He had some 6550s I had hoped to nab also. I'm bringing: The DQ-20's, Oppo-103, and cant decide on what amp/amps. Either the Sunfire 625x2, TFM-75 or the Cherry260's.....any suggestions?? Bring them all! I'd love to hear every one of them with the preamp we are bringing and your DQ-20's. What preamp are you bringing? 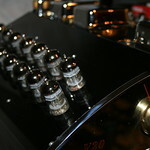 FxBill and I are building a tube preamp that will be our first audio product for sale. It's not quite on the schedule we were hoping for, so it may not be as "finished" as we want at the fest. Isn't every day in Bryson City a 50% chance of rain this time of year? As long as it works Bring It! You can work on looks later. I'd love to hear it. What toobs will you be driving it with? We have some tube rolling to do before we decide on which tubes will be included and our website (still under construction;^) will likely have an article on that process. We expect to bring some to the fest to compare, too. CARVER C-11 - Thanks Trav! CF Tube Pre - Thanks Ray! Mark finished up SyeveK's CF pre for me and Ray delivered it. Just need a loaner sub if someone has one to lend. Tubes available to borrow/try if anyone wants to roll them.